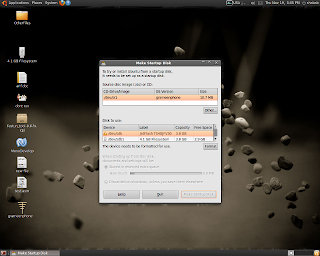 Install Ubuntu in Your Pendrive!! Pendrivelinux is a concept to put your workspace and all your stuff in your pendrive. There are several distributions specifically designed for such purpose. Most of them are small and compact. Ubuntu itself can be installed in a pendrive. For this you don't even need to know a lot of linux, coding or anything complicated. All you need is a USB drive or pendrive, linux version to install. The capacity of the USB drive depends upon what distro you are about to install. If you want a minimal installation disk it would be less. 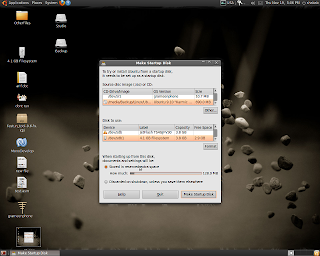 To install ubuntu in your USB stick - First of all manage all the stuff then start your existing Ubuntu. 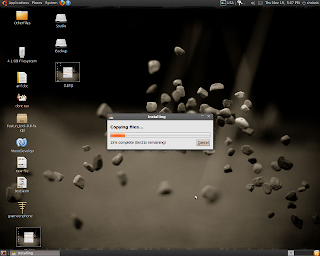 If you dont have ubuntu installed you can also do this from live session. In the upper field you have to chose an existing live CD of ubuntu. Click on "other" or "browse" to browse to your live CD iso. If you dont have an iso image then make one from any software(nero,brasero etc..) You can also enter the live CD to the CD-ROM drive and select it from the shown list. But it is recommended that you use an iso. The field at the middle part will show existing USB or Removable drives connected to the PC. select your pendrive from the list. You can format it if you wish. You will also see at the bottom a field with two options - 1st one will store the documents and changes created during the live session in a specified space. (needs larger space) and the 2nd one will discard the documents and settings created when running the live session from USB disk. Click on "Make". The process will begin. You can now use your USB stick to boot Ubuntu anywhere. You can also use this pendrive to install Ubuntu in other systems just like a live CD. Although some older motherboards does not permit booting from USB there wont be any problem with the new ones. All you have to do now is to connect the USB stick to the suspect PC and set the boot priority to proper sequence. Sit back and relax and you shall see the ubuntu splash screen shortly. For a more advanced installation you can use UNetbootin. It is a old soft but still can handle a lot of operating systems.